Much like the character in the 5th century poem Psychomachia, patience is a virtue that triumphs over anger in the end. If you read my last political event blog posting, you would know that there was a slight misunderstanding about my credentials at the Obama campaign kickoff rally in Columbus back in May. In my 'BTS' about that event, I described how I did not get in as a credentialed journalist but attended anyway in the general seating area. While I was not happy about how that day turned out, there was one 'silver lining' that made that trip worthwhile. When discussing my press status with the staff, I was able to talk directly with a campaign media representative and we exchanged contact information. She apologized for not letting me in for that event but said that I should keep in touch for future Ohio events. That opportunity finally surfaced early last month just a few miles from my house. On September 10th, local media outlets were announcing that Vice President Joe Biden would be making a campaign stop in the Dayton area, specifically on the campus of Wright State University in neighboring Fairborn early in the afternoon of the 12th (September 11th would be a 'down day' for both campaigns in respect to the 11th anniversary of the 2001 terrorist attacks). 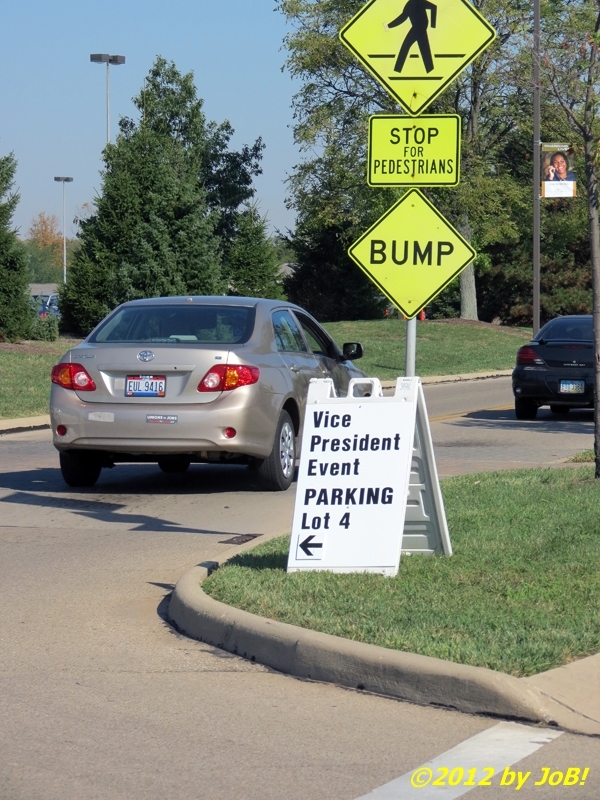 Ohio's importance in the 2012 presidential election has been very evident through the number of visits made by both tickets throughout the state in the weeks leading up to November 6th. I emailed my contact and asked her if it was too late to be included in the formal media for this event. Although I did not hear back from her until late in the afternoon on the 11th, she said that she was doing work in Florida to prepare for a future event but would forward my information to the main press office for action. This was cutting it a little too close but I would take my chances and show up bright and early the next day to see what would happen. 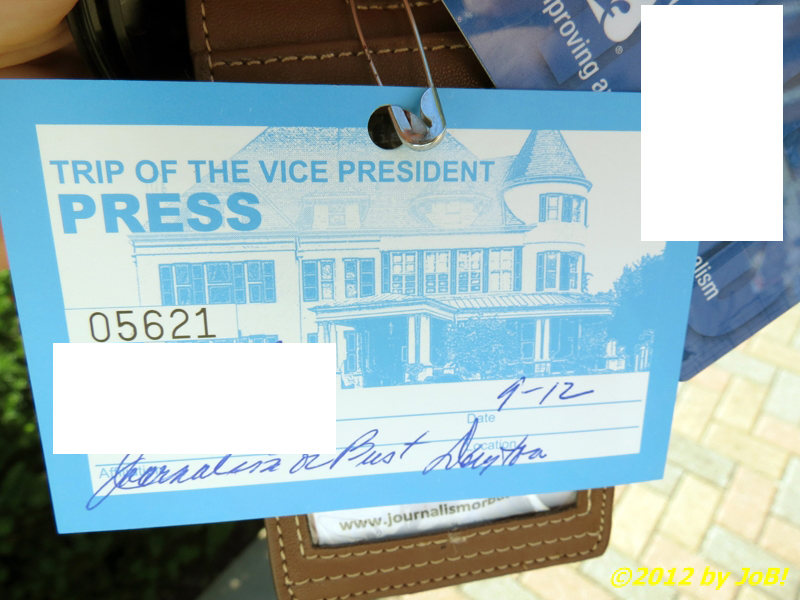 I ran how the events of the next day would go down and came up with a way to cover as much of Biden's visit as I could. Due to the email delay, I visited the local Obama for America office to pick up a ticket to attend the "Grassroots Event" so I would be still be able to get in if turned down for media credentials. If credentialed, I would take advantage of the press areas to get photographs and video of his remarks as well as others prior to him taking the podium. 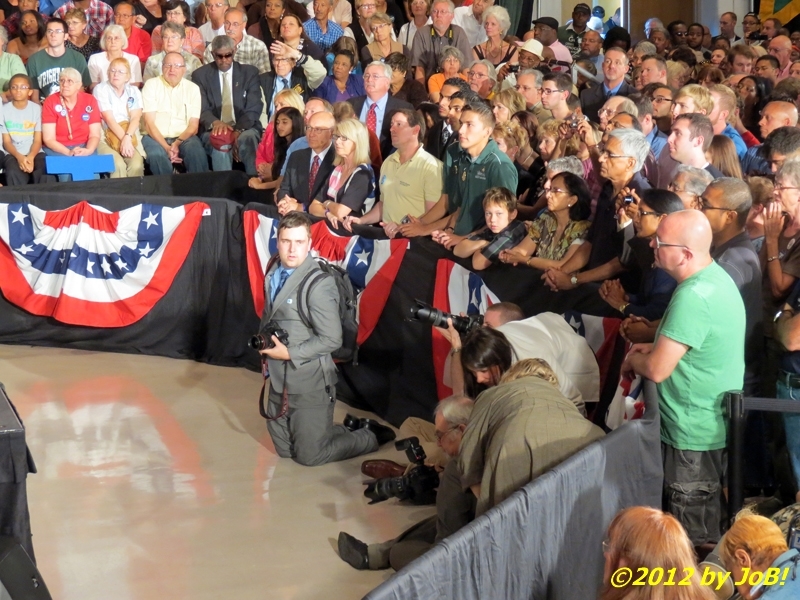 After his speech, I knew that he would work the 'rope line' to shake hands and take pictures with folks lucky enough to get next to the stage so I made sure I found a vantage point to allow for my own photographs. 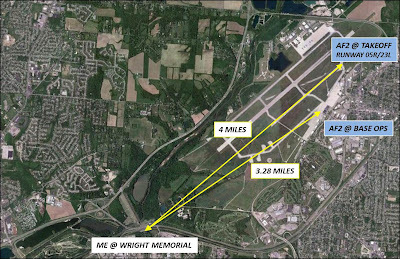 Since this would be his only stop in the state on that date, he would be using Air Force Two to fly in to Wright-Patterson Air Force Base for the quick trip over to the nearby campus. 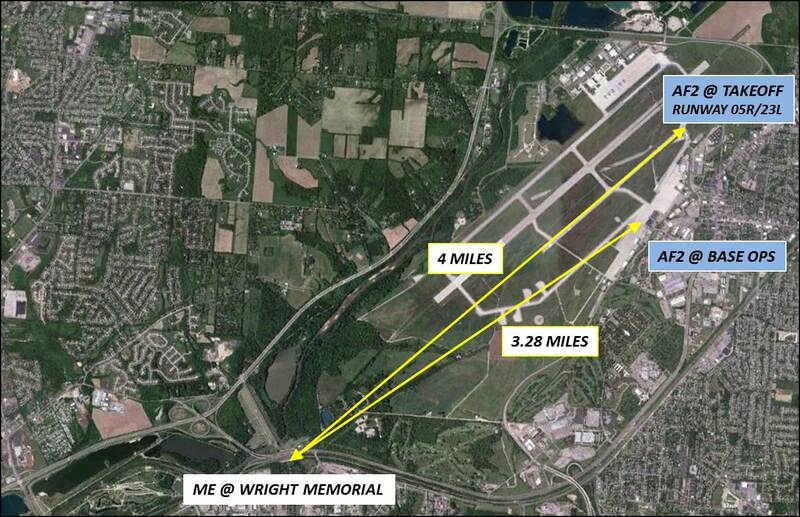 Since I knew I would not be able to cover the arrival, I figured that I might be able to capture his departure from Wright State and from the base if I properly planned it out ahead of time. I arrived on that Thursday morning at the announced door opening time and parked in a lot just across Colonel Glenn Highway from the venue (there was a general lot reserved for attendees but it might prove difficult to get out of after the speech and before the motorcade left). With my equipment bag in tow, I walked up to the crosswalk to make my way across the busy 4-lane road and was greeted by a group of about a dozen or so people who showed up to protest Biden's visit. 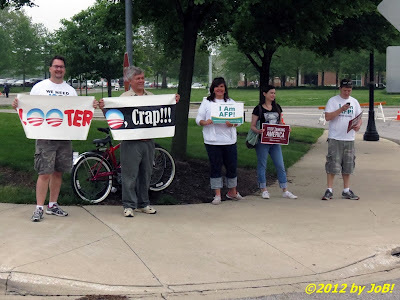 While a few of them said they were from the local, many were from out of the Columbus area (I met several of similar protesters at the Obama rally back in May). 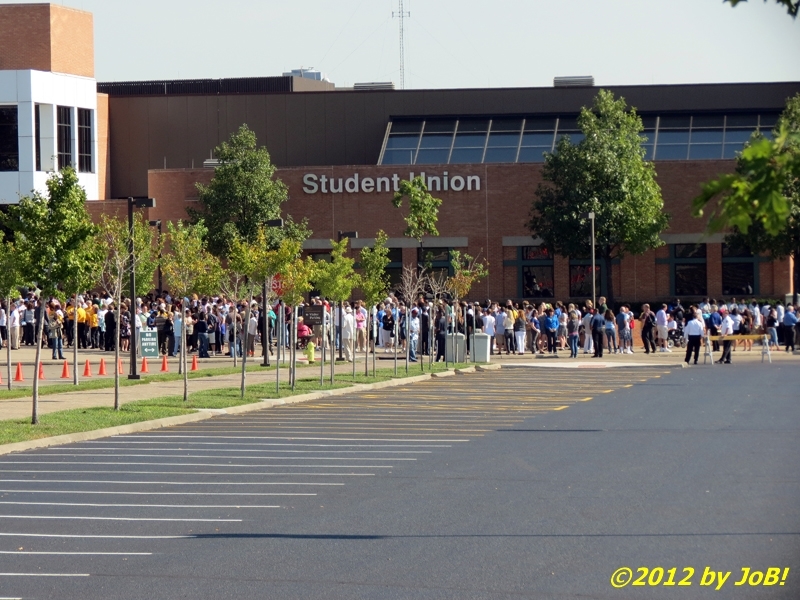 I snapped a few pictures and crossed when the light changed to get over to the Student Union Building. 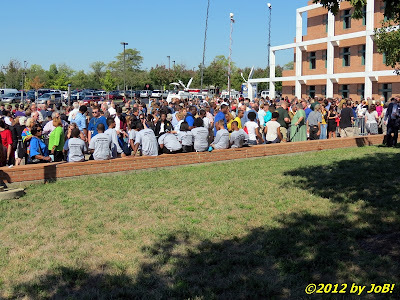 A large crowd had already amassed when I walked up to the press check-in area and I was hoping that I would not have to get to the back of that line. I presented my blog badge and several forms of identification to the attendee and kept my fingers crossed. She initially told me that I was not on the list; however, she was able to take my information and add me to it on the spot--SUCCESS!!! She handed me my credential along with a safety pin to secure it to my lanyard and directed me towards the press entrance for the pending security sweep. My persistence finally paid off (and this one was not taken away)!!! I moved in that direction but I wanted to drink in this moment for a little while. I started taking some pictures of the crowd and the various media trucks that were there to cover the rally for noontime and evening telecasts when I struck up a conversation with a photographer that I had run into at a Romney townhall meeting back in March (I recognized him because he was the guy who used a tall ladder to take some photographs of the former Massachusetts governor during that event). He shared some tradecraft items with me and we exchanged contact information before he ventured over to take pictures of the protesters I met earlier. After he left, I recognized one of our local celebrities, comedian Dave Chappelle, requesting tickets for some Wright State students from the events staff. While he lives in neighboring Yellow Springs and is frequently spotted at various locations in and around the Miami Valley, this was our first meeting and I stuck out my hand to shake his. He reciprocated but told me he was leery of the press and I promised him I would not include him in any of my reporting (I did snap a few pictures just to prove that it was actually him and I will keep my word by not posting any of them here). I proceeded to the media's security checkpoint and had my body and equipment 'wanded' for any suspicious items (with a dog sniffing through my belongings for good measure). Once through, I made my way to the Apollo Room where the vice president would be making his remarks at approximately 1PM. 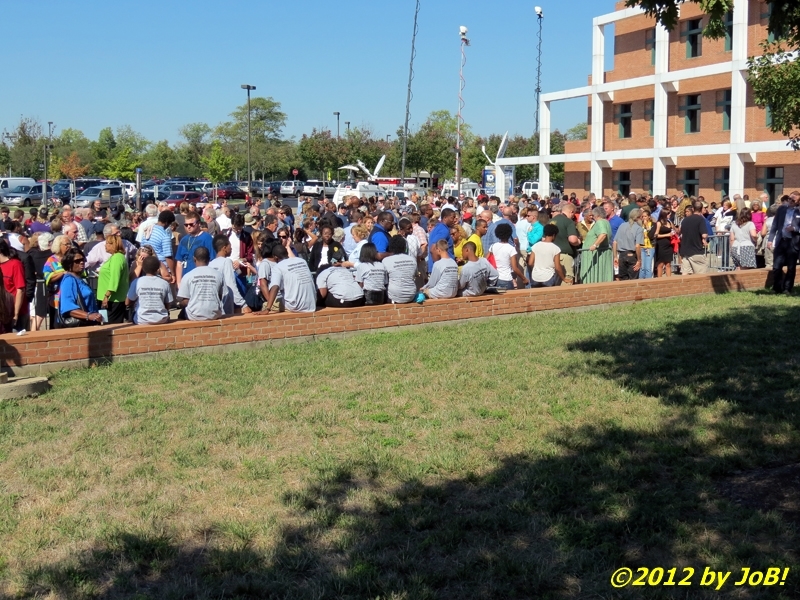 Prior to that time, there were several other speakers who addressed the growing crowd. Steve Culter, a local labor leader and Marine veteran, led the Pledge of Allegiance, Heather Dorston, a Wright State alum and campaign volunteer, sang the National Anthem and Pastor Earl Harris provided the invocation. Luis Luiggi, a Wright State student and a US Navy reservist who spent a year deployed in Afghanistan, next talked to the audience about his experiences and how they translated into support for the Obama/Biden ticket. 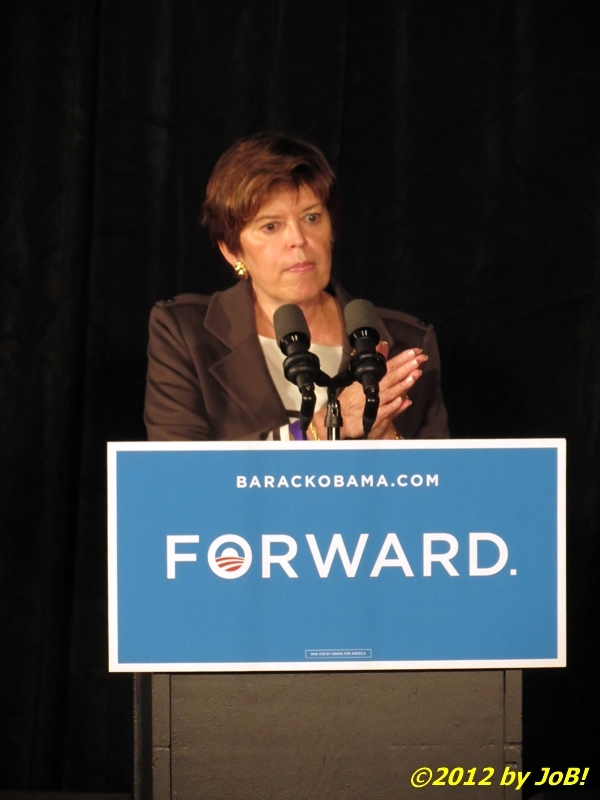 The Democratic nominee for Ohio's 10th Congressional District, Sharen Neuhardt, also threw her support behind the current White House incumbents during a short prepared speech. This activity was scheduled to coincide with live broadcasting by local and state television outlets for their noon newscasts and ended around 12:10PM, leaving a 50+-minute gap between the last speaker and the vice president. 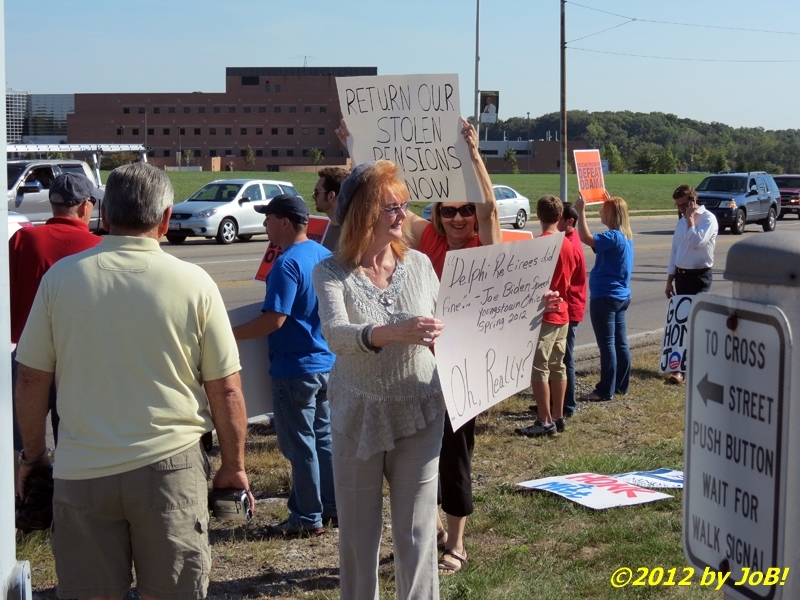 During that long break, I got to chat with several television and print reporters. Katie Ussin, WDTN's newest anchor, allowed me the honor of taking a picture of her and her cameraman with her iPhone for her Twitter account. When watching WBNS's Jim Heath give his update, I was very impressed with how he prepared for that live spot, 'cramming' with information from his smartphone to be up-to-the-minute with his televised comments. Meagan Pant, a higher education reporter for The Dayton Daily News, was there to focus on the vice president's remarks related to college, specifically funding issues. 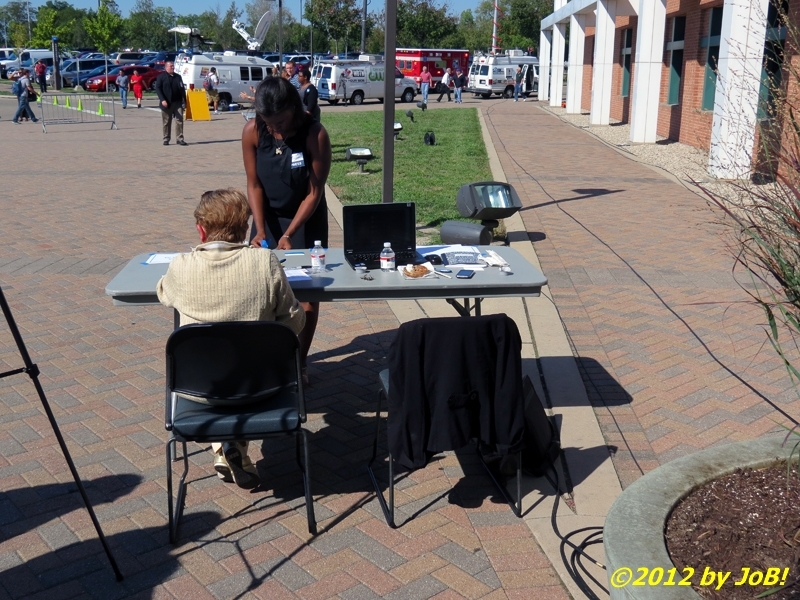 I also got to talk with an Obama for America volunteer that I met the previous day over in their Beavercreek office when I got the ticket I, fortunately, did not need to use. 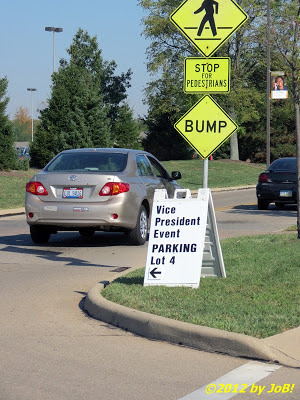 It was just a little after 1PM when we got word that Vice President Biden was en route from the base and would be at the campus shortly. 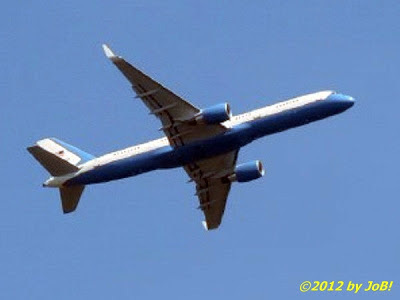 This helped prod the waiting crowd to start making some noise in anticipation of his arrival. Once his 31-minute speech was completed, he made his way off the stage and down to the "rope line" area for handshaking and picture taking. 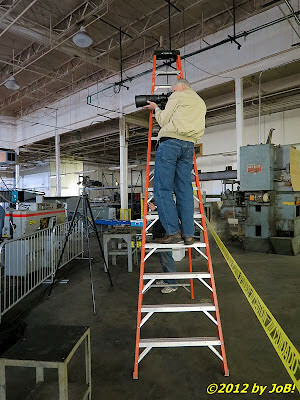 Remembering my plan, I was able to get a spot up on the media riser to capture some of those moments. After about 5 to 7 minutes, the vice president was whisked backstage by his security detail and the "Grassroots Event" was officially over. Now to the next part of my coverage plan. As I left the Student Union Building, I looked around for some clue about his ground transportation mode for the day. I assumed that it would be a standard motorcade, but with the new Secret Service buses in use for this election cycle, I kept my eyes peeled for any large black object in the parking lot. 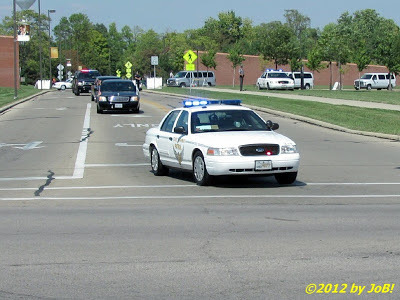 As I made my way back to my car, no buses caught my eye and two black stretch limousines were lined up with a bevy of motorcycle-mounted police officers lined up in front of them. Since the easiest way back over to the base would involve Colonel Glenn Highway, I made my way to a spot just across the street from where the motorcade would make a left-hand turn to proceed east along that road over to Ohio State Route 844, a spur freeway that connects the base with Interstate 675. 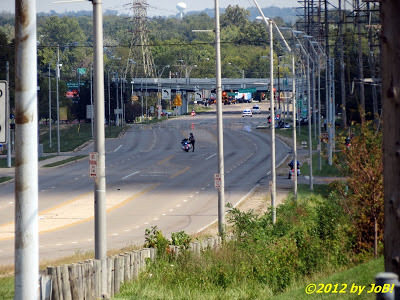 In a pre-staged operation, Colonel Glenn Highway was already cleared of most traffic and the motorcycles later sped off to assume positions along the public route back to Wright-Patterson Air Force Base. With two Ohio State Highway Patrol vehicles leading the way, the stretch limousines made their way onto the divided highway followed by a long line of other support vehicles and personnel. 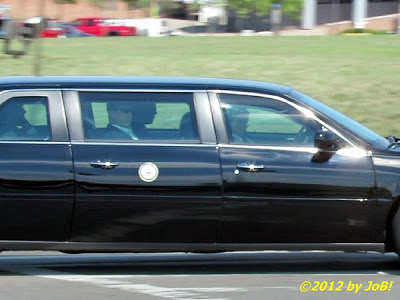 I was able to get some screen captures of the speeding motorcade with my camera's HD video feature (with full 1920 x 1080 resolution) and they turned out rather clean as they zipped along the deserted stretch of road. I assumed that Biden was in the first one so I zoomed in on it as it turned the corner at University Boulevard and I believe that I caught him on the phone as he went by. With the vice president en route back to the base, I needed to quickly get to my car to accomplish my last objective of the day, capturing the departure. I knew that I would not be able to get onto the base (and per my agreement with their Public Affairs office, that was not part of my plan) so I headed over to the next best option. As a frequent cyclist on several bike trails in the local area, I knew that there is an overlook of the base's flight line at the Wright Memorial, part of the Dayton Aviation Heritage National Historical Park. 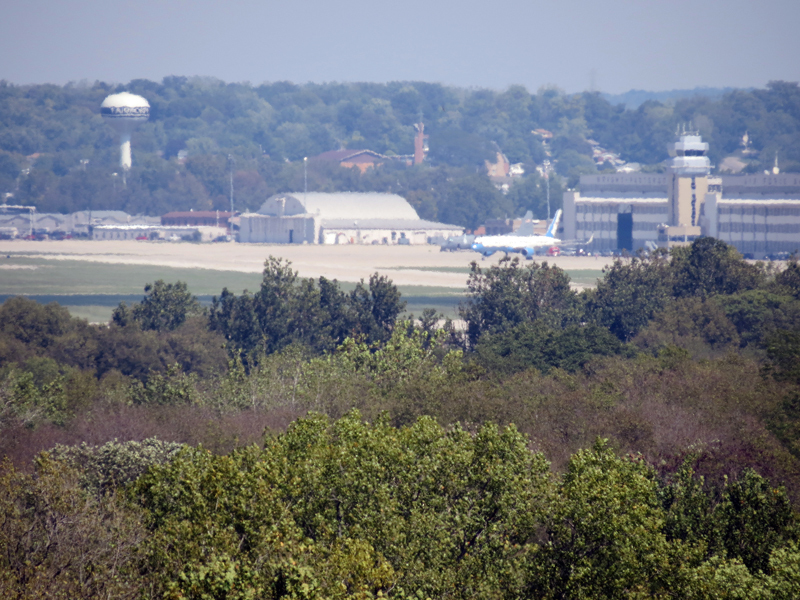 This point sits above the Huffman Prairie area of the base, the location where the Wright Brothers did early aviation development and training. However, just beyond this historical area, the base's two active runways are visible--even from a distance of several miles. I made the short drive over to the site and walked to the observation area with only a cellphone and digital camera in my possession (I did not want to attract any undue attention from a helicopter that was performing security sweeps above me). 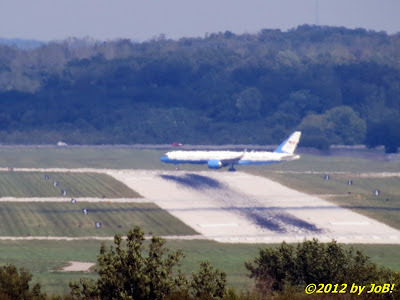 I was able to see the blue-and-white colored C-32 variant of Boeing's 757 commercial airliner parked over by the Base Operations building and I used my camera's digital zoom feature to get some photographs. With my audio and video recordings secured, I returned to my car and subsequently headed to a local sandwich shop for a long-overdue lunchtime meal. 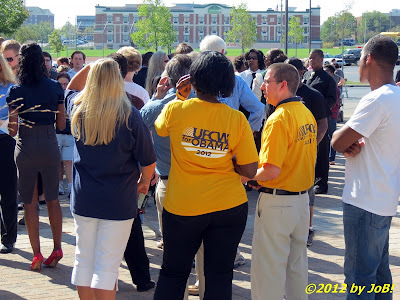 All in all, I felt that this was a very successful event for me and well worth the patience expended with the Obama campaign staff to finally get media access to one of their Ohio events. Little did I know that it would not be the last one I would cover (and that will be the subject of an upcoming post).